The use of Rebound to evaluate the strength of structures through measurement of surface hardness is an established and well understood test. 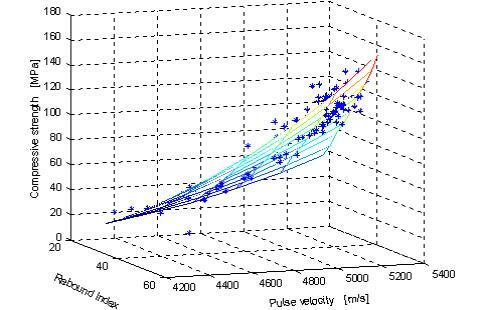 Ultrasonic Pulse Velocity [UPV] testing is usually used to assess concrete quality and for defect location but also has a lesser known correlation to concrete strength. The Rebultra or SonReb method combines results taken from both to give a better evaluation of strength than either test alone. The principle is that rebound is primarily a function of hardness that relates to modulus while UPV is more related to density. 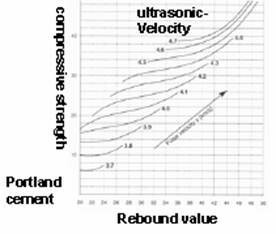 As compressive strength is a function of both density and strength it is not surprising that a better estimate of strength is obtained by integrating the rebound and UPV measurements. Literature has shown an increase in accuracy of up to 15% over Schmidt hammer or UPV testing alone. The international organization RILEM has published a number of papers on the combined use of UPV and Rebound for the estimation of concrete strength. The relationship below stems from one of those papers. It should be noted that conduct Rebultra testing it is best to create a local calibration curve similar to the one at the right. Their paper then goes onto discuss the grouping of concrete samples by aggregate type and age for the best results for a better correlation. ACI 228.1R agrees that the compressive strength of concrete can be considered proportional to the UPV to the power of 4 as indicated in formula 2. “Evaluation of Actual Compressive Strength of High Strength Concrete by NDT” by Pascale et al (2000) compared the Rebultra method to a number of methods including micro-coring, Windsor probes and pull-out tests as well as Rebound and UPV individually. It found issues with regards to use of a number of test methods where the concrete strength high but found that Rebultra worked well at any strength level. A newly inbuilt function in the Pundit Lab+ enables the joint analysis of rebound and UPV, this allows the calibration curve to be entered onto the equipment for instantaneous conversion to strength using custom user defined regressions. A common task is the location of footings below a slab, as well as determining their size, length and reinforcing layout. This generally comes about because drawings are not available and the usage of a slab is changing with renovations or a fit out. Most of these characteristics can be determined non-destructively which for most clients is the only option. The techniques available are: Impact Echo (IE), Sonic-Echo/Impulse Response (SE/IR), and Ground Penetrating Radar (GPR). In layman’s terms GPR measures changes in layer materials using microwave reflection, while IE and SE/IR determine depth by reflection of pressure (sound) waves. They can all be used as complementary tests or independently. As with anything there are tradeoffs for using any technique so for example; GPR will be sensitive to the amount of reinforcing in slab and footing whilst IE and SE/IR won’t. The choice of using IE or SE/IR technique for an application will be determined by the dimensions of the footing and the existence of piles below the footing. As a rule of thumb any footing with depth between 1-2 times the lateral dimensions will use IE whilst longer footing will require SE/IR. IE can be used in the location and dimensioning of footing, whilst the footing will have to have been located by other means (i.e. GPR) to use SE/IR. Recent developments in IE and SE/IR include more onboard analysis of data and the introduction of scanning and automatic test heads for IE. Both of these developments are embodied in the NDE360 platform available from PCTE from our supplier Olson Instruments. GPR provides a quick scanning technique. It is particularly useful when locating footings. It is also the only technique capable of locating rebar at the footing depth. For high quality data capable of locating the reinforcing accurately the antenna frequency should be as high as possible (i.e. 1.5 to 2 GHZ). However the higher the frequency the lower the penetration and so there is a direct tradeoff between locating rebar and penetrating to the base of a footing. It may be necessary to employ two frequencies (i.e. a 2GHz for rebar and a 900 MHz or even 600MHz for finding the footing depth. The Aladdin GPR system enables the use of duel frequency arrays and discrete antenna. Its duel polarity 2GHz antenna also offers the greatest depth possible on the market currently whilst still providing hi-res imagery. From 9th - 12th August PCTE and Proceq presented a seminar around Australiaon applications using Proceq’s testing equipment. 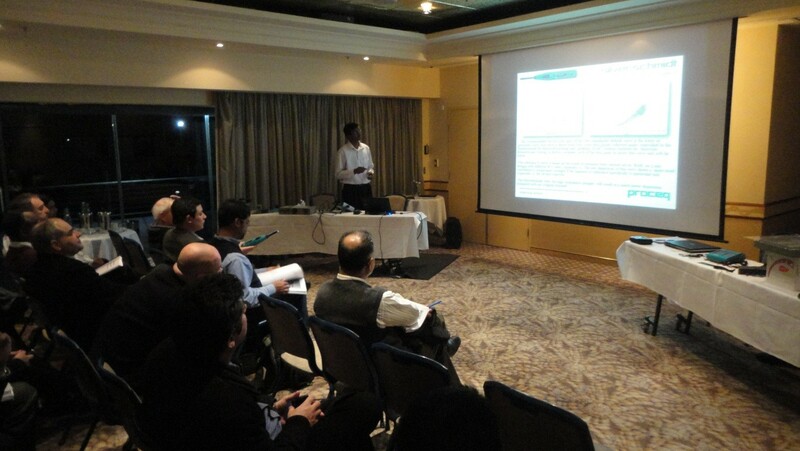 The presentations introduced several key new aspects to structure investigations. FHWA tests (using the ResiPod) showed a high degree of correlation between Resistivity and RCP results. RILEM TC-154 relates resistivity to design life based on theoretical relationships between resistivity and chloride diffusion and corrosion rate.